The all-new Gerber Gator Premium fixed blade knife. 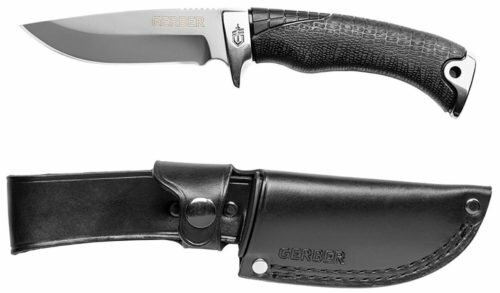 Gerber released their Gator Premium Fixed-Blade Knife this year, in a tribute to the 25-year old line that established Gerber as a quality knife maker. From handling these knives at SHOT Show, and having had very positive experiences with certain Gerber knives, I believe the Gerber Gator Premium knife is ready for professional use. The new Gator Premium fixed blade knife is a full-tang design made with quality CPM S30V stainless steel, providing outstanding corrosion and wear resistance. The Gator Premium blade is 4.0 inches long with a plain razor, drop-point configuration. The Gator Premium blade is machine polished and semi-mirrored, finishing off an already impressive aesthetic. Each knife bears a stamped Gerber logo as well. The Gerber Gator Premium is well-balanced. Gerber claims the Gator Premium sports their most stylized handle yet. Made with glass-filled nylon and wrapped in a highly rubberized grip the Gator Premium handle is specifically designed to provide superior grip during harsh and wet conditions. The reptilian texture captures the essence of the alligator’s skin that inspires this highly popular Gerber knives. The Gator Premium’s lightly textured, grooved nylon top is a chafe resistant barrier for bare hands work. A high polished rear pommel and front bolster give the Gator Premium a natural balance. Advanced manufacturing coupled with a unique reptilian texture grip, deliver reliable and confident grip in any situation. The American leather sheath is high quality. 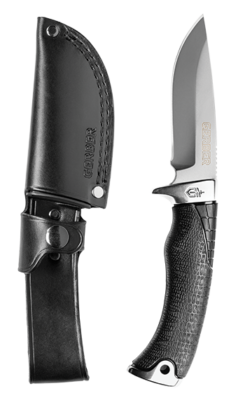 The Gator Premium comes with an American made leather sheath for safe transport and storage. The leather appears to be high quality, though is not as preferred for modern knives as in years past. Though the leather should last for many years, a lighter nylon sheath with Molle connections and Velcro straps might be more attractive to law enforcement users. There is also a gut-hook version of the Gator Premium knife for hunters. Though not specifically designed for police work, there may be a few limited uses. The gut-hook version is best suited for hunting or outdoor uses, but may have limited LE use as well. I have possessed and used several Gerber knives in my life, and each one has been well made and lasted through heavy use. I was able to handle the Gerber Gator Premium at SHOT Show, and I really appreciated the grip texture and overall balance of the knife. The steel and blade cut appeared to be well made and durable. Gerber has had a bad reputation in recent years, mostly due to their mass-produced and “commercialized” products made in Asian countries. Many knife makers use steel from China, but the end results vary as much as the end efforts of the manufacturer. Some of these complaints may have had merit, but overall I believe Gerber still makes some quality products. The Gator Premium knives are the later.